Barefoot Angie Bee: Imagining, packages, I won and Dam to Dam. Imagining, packages, I won and Dam to Dam. Hello to all the new bloggie friends!! I keep seeing the numbers rise on my followers list and am entirely humbled and sometimes shocked that you want to read about this crazy barefoot runnin' mama! Glad to have you along for the ride! My dear one and I have been working in the backyard over the last week. I have planted all 24 of the tomato plants and 6 large containers of sweet basil. Jaymon has been cutting down light starved, unhealthy trees and we have been hauling the logs off using the garden wagon. It has been so heavy at times that I have been almost horizontal digging in trying to pull the load. I had these vivid scenes playing out in my head of the handle on the wagon snapping off and I go flying face first in the dirt. It made me laugh and the work easier. My legs are so stinkin sore today!! My legs were protesting this morning while running my 5 barefoot miles on the treadmill. I had planned to take one of the early rising spawn out for a run in the stroller but we are having up to 40 mph wind gusts and my active imagination was set loose with vivid scenes playing out in my mind consisting of a spawn flying away like a balloon boy that was actually in the balloon! So as an alternative I imagined flying off the back end of the treadmill instead of loosing a spawn to high wind. Story time with Milo(my belching spawn) at the library, fruit shopping and when we arrived home I was greeted by happy children and lots of packages! Devon at Outside PR sent me a GU performance energy sampler! 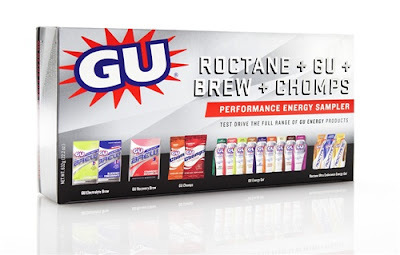 I am a huge GU fan after discovering that they are gluten free, some have caffeine and they don't upset my stomach even on a long run after I feel like I would rather die than put anything in my mouth. Although logically I know in my stubborn brain that I must fuel up, its hard to actually put fuel in my mouth after about 18 miles. Chocolate Mint Gu on the other hand make it hard not to eat before the run much less every mile before and after 18! At some point I will practice again eating real food while on the run. Another gluten free runner suggested boiled potatoes and salt. It may not sound great now but the blandness would be welcomed after 18. I know you could never forget this photo!! 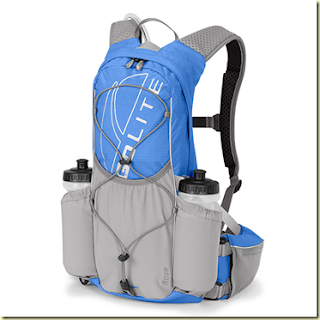 Thanks to all of my friends both virtual or otherwise who voted for me when Beth at Shut Up and Run held a dorkiest photo contest to win a Golite Rush hydration pack. I am now the proud owner of this hydration pack and can't wait to try it out!!! I won and now I feel super obligated to run that marathon and 50k that this will help me train for!! I have motivation to serve up with my GU and nuun that I will carry around in this sweet blue pack! 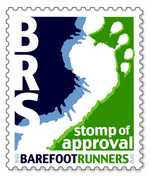 Remember a few days ago I was talking about Jason Robillard's Barefoot Running book? I received a brand spankin' new copy to give away to one of you!! You know you want to give barefoot running a try either to start over from injury, just because it looks so fun, or to supplement your training you are doing already. This book will help you get started. Jason is one funny cat and you will like the information as well as the way it is presented. Stay tuned for that giveaway to start in a day or so. Its the perfect time of year to give barefoot running a go! In other running news, I signed up for the Dam to Dam 20k this morning! Last year I ran it shod and this year I want to PR barefoot. I have already beat my 20k time barefoot based on my half marathon time last fall but I am excited to run the same race again and see how I do. This race is such a blast! Great course, loads of music all along the way as well as food at race packet pickup for the whole family, a race poster and lots of food after. Not just bananas and donuts but Subway subs, BBQ, beer and ice cream!! Most all of this I can't even eat due to food intolerances but its awesome none the less!! 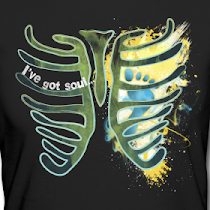 There are some very groovy giveaways going on around the blogsphere this week! Check my sidebar for links and check out day 4 of 5 days of giveaways at Setting you Free. Today's giveaway is for a Brooks EZ Girl Power T. Don't forget to sign up for my Whooha Gear $20 credit giveaway! Have a fantastic day and if you are out there running, don't blow away! Wow you have a lot going on! I love gu! Chocolate is my favorite! I could eat those all day! That backpack looks really cool. You will be well hydrated, that's for sure. Boiled potatoes with salt -yummy. I wonder if sweet potatoes would be good also. I am seriously considering getting Barefoot Running book. I need at least to read about running until my Achilles feels stronger. A good day in Angie B land! I was laughing at your imagination of the little guy getting blown all over the place--the imaginations of mothers! Congrats! Now that's an OUTFIT! Let me know how the back pack works out! I am smiling for you Angie:) Congrats on all of your cool stuff!! It was a good day for you! That picture still cracks me up! I so want to run Dam to Dam as my Iowa race. It won't be this year, but maybe next year I can get out there. I have been trying to use my Nike Frees for one run a week right now, to help me transition down to vibrams.I just knew I needed to go slow!! Thanks for posting about the Gu sampler. I'll be getting one of those. love being one of your followers!! I finally got some water socks as you advised! I went to WalMart twice, and they didn't have my size, so I picked up a pair at Target. They have several slots in the insert (for what reason other than to irritate and tear up your foot, I don't know), so I had to wear socks with them. I did 3 Gray's Lake loops with them on, then switched to shoes because I was starting to blister, and did 2 more loops. Yes, running shoes cushion the arch and heel, but they also make it more difficult to avoid hitting the arch and heel. blogger is acting pretty screwy! !